Attention please, guys! HiKey from LeMaker, the early bird version is coming next month. 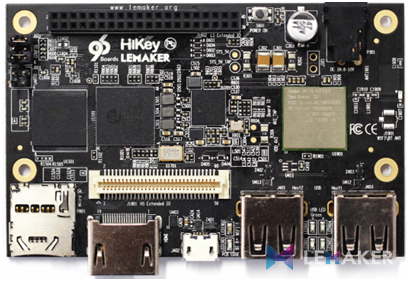 HiKey from LeMaker is the first ARM64 bits SBC. It is powered by the Kirin 620 SoC with Octa-core ARM Cortex-A53 64-bit CPU up to 1.2GHz and high performance Mali 450MP4 GPU. It also has 1GBLPDDR3 DRAM (800MHz) and 8GB eMMC Flash on board. More product information, please refer to http://www.lemaker.org/article-57-1.html . HiKey is also a board that satisfies the Linaro LCG 96boards standard. About 96boards, we can see more from https://www.96boards.org. With the standardized expansion bus for peripheral I/O, display and camera in the 96boards ecosystem, we have plenty of add-ons to work on HiKey. LeMaker, as one of the LCG(Linaro Community Board Group) members, we will contribute much more resource and technical support to 96boards community. It is said that LeMaker will release HiKey soon. If you are SBC funs and have interests in HiKey, you can get everything ready and wait for HiKey now. Stay tuned, more information about HiKey will be followed soon!